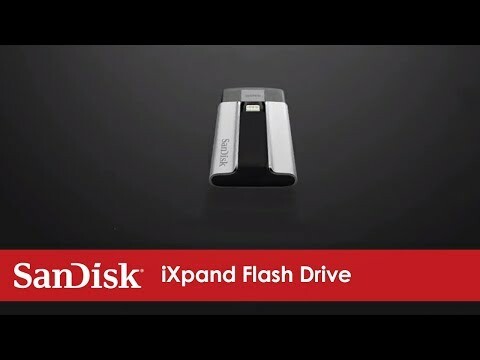 iXpand™ Flash Drive is the easiest way to transfer photos and videos between your iPhone, iPad, PCs and Mac computers. Quickly free up memory on your iPhone or iPad, and instantly expand storage by up to 128GB1. Offers 16, 32, 64 or 128GB1 so you never need to worry about being out of memory. Lightning and USB connectors make it a snap to move pictures and videos between devices. The fastest way to move files on-the-go from your iPhone or iPad. Play all popular format videos2 and music files from the drive through the iXpand Sync app available on the App Store for iPhone and iPad. Lock files on your iPhone or iPad using a password3 and just as easily unlock them on your computer or using touch ID. The iXpand Flash Drive is powered by the iXpand sync app which allows you to securely and seamlessly transfer your photos, videos and files to free up memory on your device. Some DRM-protected content cannot be streamed. Check with content provider for playback restrictions. A great addition to anyone’s arsenal, the iXpand may be tiny, but it packs quite a punch. Pop into a bag and you’re good to go. Good for backing up your photos as well as ensuring you can never run out of storage. . . The days when one can complain that the iPad doesn't have a memory card slot are essentially over because there are so many ways to add additional storage capacity through the Lightening port. One of the best of these is the SanDisk iXpand Flash Drive. In fact, I really didn’t find anything I didn’t like about the SanDisk iXpand Flash Drive. It does exactly what it’s supposed to do and if you’re looking for an easy device to move files to and from your iPhone then you really can’t go wrong with SanDisk’s iXpand Flash Drive. When it comes to iPhones and iPads, storage can be a huge pain... SanDisk, a longtime leader in flash memory, invented the iXpand to alleviate these frustrations. It’s essentially an extra-wide USB thumb drive with a built-in Lightning plug and an internal battery. I got a chance to use it over the past week, and I was pretty satisfied with the product. Score: 4 ½ out of 5 – iXpand comes with plenty of options to back up your iPhone's photos, and keep your most important files with you at all times. 1. 1GB=1,000,000,000 bytes. Actual user storage less. 2. Support for .WMV, .AVI, .MKV, .MP4, .MOV video formats. 3. Password protection uses 128-bit AES encryption and is supported by iOS 7+, Mac OS X v10.6+, Windows Vista®, Windows® 7, Windows 8 and Windows 10.